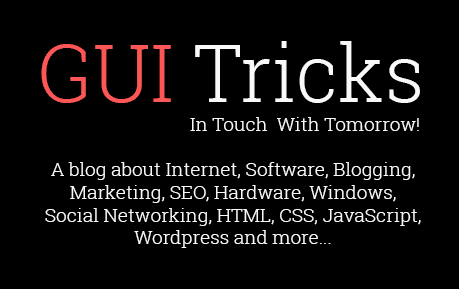 Technological Tools In Designing Logo’s | GUI Tricks - In Touch With Tomorrow! Technological Tools In Designing Logo’s - GUI Tricks - In Touch With Tomorrow! Logos can simply be described as the face of the organization which could be called a design symbol or graphic representation of a company’s name, abbreviation, trademark etc. which is used to describe a company’s product or service in short it represents a perceived image of a company which helps promote its business to its targeted customers. The purpose of a logo is apparent, rapid and effective understanding and communication of businesses, brands or event to its audience. When company are formed they plan to get a logo created or modified with time to be updated with the environment (internal & external). In previous times when you wanted to get your logo designed you would take the help of logo designers, however, in today’s world you could easily design your logo without needing the help of a logo designer by using reliable and efficient logo design software’s. If you are a first newbie in the field of logo designer, then it’s very important that you are updated and well-aware about the logo design software present in the market. The is designed especially for newbies to assist in creating professional artwork and designs enabling one to work on creating all type of designs. It’s a vector graphics editor tool which is used specially for vector drawing applications consisting of an amazing set of drawing tools such brushes, colors, gradient effects and other processing tool which helps to give your professional designs the most fabulous touches. The software consist some of the most useful features such as integration into creative cloud, Anchor point enhancements, pen tool preview, live shapes, CSS extraction etc. which play a vital part in designing logo's. This tool is one of the most important type which helps in editing and designing tasks to simple retouching the 3D designs and illustration. It has proven to be one of most useful, effective and excellent editor and design creator software which is not ordinary for it cannot be used by just anyone, for it's a little costly and delicate to be used. According to the experts, it has been found to be the most efficient logo design tool that helps them in designing logos with effective tools which includes color levels, alpha masks, artistic filters, textures etc. Another most effective easy to use, user-friendly software is Corel Draw which is designed for newbies for light drawing and editing tools which includes tools such as corel photo-paint, corel correct, power trace etc. This is mainly used for vector drawing application which helps in the creation of professional artwork and designing amazing logo designs. The Jeta logo design is a fast, efficient and powerful software to design web graphics, icons and logos designed for making a simple logo design. Also, it’s the best pick which provides a complete solution to as an expert designer or a new one. It is said that the software has around 5000 vector icons & shapes, 200 shape styles, 400 templates for logos and many other feature for create the perfect logo design. This is designed especially for designers & editors to assists them for 2D and 3D visual effects composition which has been introduced by Apple Inc. It's the best software if you want to create stunning designs and effects which is designed specifically for motion graphic style. Also know that the software has rich content library to design some brilliant logo designs. Besides this you can find many easy to use, amazing software such as Logomaker, LogoSmartz Logo design software,Summitsoft Logo design Studio, Quick logo designer, LogoYes, Elica etc. and many more. Ashley Steve works in logo design services. She has a lot of interest in gaining information in the field of business and likes to be updated on technology.